In an earlier blog “Swami Vivekananda, the dynamic Jeevanmuktha” I had briefly described the meeting between Sri Ramakrishna Paramahamsa, referred to hereafter as Sri Ramakrishna and Sri Narendranath, referred to as Naren hereafter, and how the latter blossomed into a spiritual giant, Swami Vivekananda, under the nurturing of the former. Now I propose to deal in a little more detail on their unique relationship in which the Master, Sri Ramakrishna, had great faith in the potential of the disciple, Naren and the disciple in the spirituality of the Master but would not accept anything that did not satisfy his reason and who also believed in the philosophy of Brahma Samaj that there is no need for intermediary to realise God. How young rationalistic Naren blossomed into a spiritual dynamo who took the Western world by storm and became the beacon light of spirituality for Young India, under the guidance and grooming of Sri Ramakrishna is well documented in the biographies of both. The incidents narrated are based on those biographies. One day Sri Ramakrishna in the Samadhi state had a strange vision. He was soaring high in a luminous path. He soared higher and higher and came to a point where no one was seen, but only seven sages seated in deep meditation. As he was gazing at them, a portion of undifferentiated light took the portion of a child, went to one of the sages, clasped his neck with its lovely arms and told him “I am going down. You too must come with me”. The sage in meditation opened his eyes and gazed at the child with love and tenderness and again closed his eyes. But now a fragment of the body and mind of the sage started descending down to earth as a ball of light. When Sri Ramakrishna came out of the Samadhi, he realized he was the child in the vision and now he began looking for the sage. When young Naren came to him with his friends in his quest for meeting someone who had seen God, Ramakrishna realised that he was the sage in his vision. So he felt intensely drawn to him, and in the first meeting itself he took the bewildered Naren aside, took Naren’s hand in his and said with tears flowing from his eyes “I know you are the ancient sage” among other things. Naren who was expecting to receive some private instructions, was completely baffled by his strange words and behaviour but heard him fully and allowed himself to be fed sweets by him and also promised to visit him again. As they came out of the room Sri Ramakrishna asked Naren whether he sees a light before falling asleep. When Naren replied in the affirmative, Sri Ramakrishna declared before others that Naren was a Dhyana Siddha, an adept in his meditation even from birth. As Naren loved to meditate even as a child, these remarks convinced Naren of his deep spiritual powers but left him confused as to his rationality in view of his eccentric behaviour. In this first meeting only, Naren popped his usual question “Sir, have you seen God?” and received the now world-famous reply “Yes, I have seen God. I have seen Him more tangibly than I see you. I have talked to Him more intimately than I am talking to you”. So when Naren returned alone next month, it was with the opinion that Sri Ramakrisna was a monomaniac. This time another strange thing happened. Sri Ramakrishna moved slowly near him and placed his right foot on Naren’s chest. Then whole world including the walls of the room seem to whirl around as he drifted into a void. In a state of panic Naren cried aloud ”What are you doing to me? I have my parents at home”. Sri Ramakrisna laughed aloud and stroked his chest stating everthing will come in time and Naren became normal. Naren thought he had been hypnotised but he wondered how a man of strong will like him could be hypnotised against his will. So the next time he went with a resolve that he will not relax his guard even for a moment. This time Sri Ramakrishna took him for a walk in neighbour’s garden. After a walk when they sat down in the parlour, Sri Ramakrishna looked at Naren strangely and fell into a state of trance. And in that state of trance he touched Naren and Naren lost consciousness and knew nothing until he regained consciousness, when he found Sri Ramakrishna stroking his chest. Sri Ramakrishna later revealed that he questioned Naren in his unconscious state and got the confirmation that Naren was the sage as he surmised and that Naren will give up the body in yoga the day he realised by himself the truth about his self. Sri Ramakrishna tried to initiate him into Advaita philosophy by asking him to read aloud Advaithic scriptures like Ashtavakra Gita. Groomed as he was in Brahma Samaj doctrines, Naren rebelled against the concept of Jiva-Brahma Ikyam calling it a blasphemy akin to atheism. But Sri Ramakrishna persisted with his efforts arguing that Naren should not try to limit God’s infinitude and he should try to pursue the path of Truth, praying to the aspect of God that appeals to him without rejecting other views off-hand. On one such occasion Naren left the room and went to the relative of Sri Ramakrishna in the next room and said with a big laughter “How can this be? The jug is God, the cup is God and we too are God; nothing can be more preposterous!” Sri Ramakrishna then entered the room in a state of semi-trance and touched him saying “Hallo! What are you talking about” and went into a state of Samadhi. What effect it had on Naren can better be described in Naren’s words, as given in his biography. “That magic touch of the Master, that day immediately brought a wonderful change over my mind. I was stupefied to find that really there was nothing in the Universe but God! I saw it quite clearly but kept silent to see if the idea would last. But the impression did not abate in the course of the day. I returned home, but there too everything I saw appeared to be Brahman. I sat down to take my meal, but found that everything-the food, the plate, the person who served and even myself – was nothing but That. I ate a morsel or two and sat still. I was startled by my mother’s words “Why do you sit still? Finish your meal”- and began to eat again. But all the while, whether eating or lying down or going to college, I had the same experience and I felt myself always in a comatose state. While walking in streets, I noticed cabs plying but I did not feel inclined to move out of the way. I felt that the cabs and myself were one stuff. There was no sensation in my limbs which I thought were getting paralyzed. I did not relish eating, and felt as if somebody else were eating” This lasted for few days and his mother started worrying about him. In a few days this state slightly changed and he started seeing things as if in a dream. He will periodically knock his head against something to assure himself that he was not dreaming. In another few days he became normal. This experience convinced him of the truth of Advaita philosophy and transformed him to see Brahman in all. Now there came a crisis in Naren’s life. Naren’s father died suddenly, leaving no money but heavy debts. Naren had to go without food on some days. He gave up studies and started looking for a job. One day he came to Sri Ramakrishna and asked him to pray to the Divine Mother to remove his poverty. Sri Ramakrishna asked him to do it himself. He entered the shrine of Kali and as he stood before the image in a prayerful attitude he saw not an image but a living Goddess of liberating wisdom and he prayed for renunciation and liberation and came back to Sri Ramakrishna. 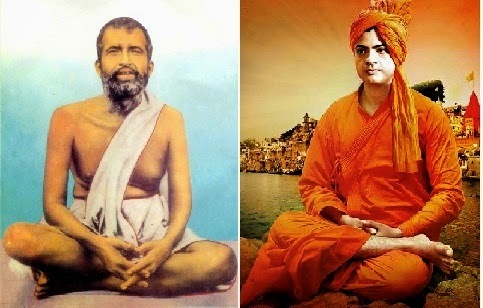 When he narrated what happened, Sri Ramakrishna rebuked Naren for forgetting the purpose for which he went there and asked him to go again and pray for the removal of poverty. Second time also he forgot the purpose in her presence and asked only for knowledge and liberation. This happened a third time also and then in a flash he realised that this was the work of Sri Ramakrishna and so straightaway asked Sri Ramakrishna to remove his poverty and was assured that his family will not suffer for basic necessities like food, clothing and shelter.